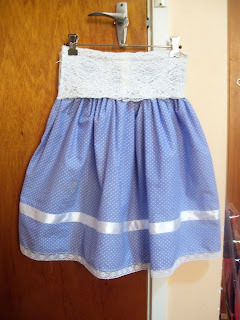 Here's a skirt I made quite a while ago (RL friends will know it well) but I never posted it because I totally nicked the design off a girl from sew_loli and I worried that she'd get upset. Now I realise that she'd be flattered. 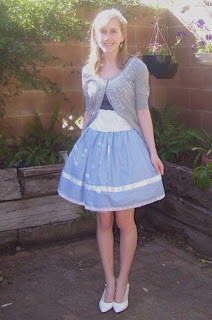 It's a normal rectangle skirt with the stretch lace sewn on top so that it fits snugly around my waist. I'll do a daily_lolita here. Here it is in its natural habitat. 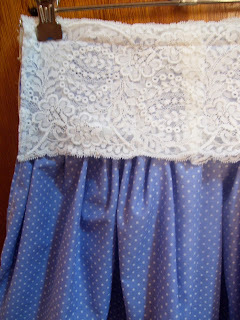 Fabrics: Blue and white polka dot cotton, stretch lace, normal lace, ribbon, zip. Here you can actually see the dots and the pretty lace. Pretty! Well done on the skirt! It looks very nice! The combination of the dots and lace works well and the light blue colour makes it feel cool - perfect for Summer. Well done.